Give rest, O Christ, to your servants with your saints, where sorrow and pain are no more, neither sighing, but life everlasting. For all who grieve the death of family, friends, and fellow citizens; remember them in your mercy, nourish them with patience, comfort them with a sense of your goodness, lift up your countenance upon them, and give them peace. O Christ, lead us home. Merciful God, forgive and heal us. Give us the will and courage to love and forgive our enemies. Be our strength, O Christ. Deliver them and us from hatred, cruelty, and revenge. Enable us all to stand reconciled before you. In the communion of the Blessed Virgin Mary and all the saints, let us commend ourselves, one another, and all our life, to Christ our God. Father Marsh, unless you object, I would like to use your litany (with proper credit, of course) in a 9/11 Mass of Remembrance at Trinity Episcopal Church in Guthrie, Oklahoma on September 11, 2011. Thanks for this beautiful and prayerful response. John, you are more than welcome to use the litany in whatever way seems best for your community. Thank you, but it is not necessary to credit me. I hope you find the litany useful. Thanks Kurt. I hope it is helpful. Beautiful. Thanks, Father. I’m offering it to our rector here at St. John’s, Johnson City, TN. Thank you Andrew. I hope it is useful to your congregation. Father Marsh: Thank you so much for sharing your “Divinely Inspired Litany”. I have been praying and search for guidance as I prepare for a special 9/11 Remembrance Service to be held in my UMC Parish here in PA. I will be praying for you and all during this challenging time of remembrance. Duane, thanks for your kind words and prayers. I hope the litany is helpful for the 9/11 Remembrance Service. Mike – Hello from East Tennessee. Thank you for your care in crafting a very beautiful and poignant litany. We would very much like to incorporate into our 9/11 remembrance here at St. Andrew’s in Maryville. Steve, good to hear from you. You are certainly welcome to use or modify the litany. I hope it is helpful. Fr. Mike, if this litany is good enough for Fr. Mosher then it is good enough for me–and it is wonderful, just right. May we please use it at Christ Episcopal Church in Springfield, MO? Jonathan Frazier. Jonathan, yes, please feel free to use it however seems best. I didn’t know you were in Springfield. One of my grandmothers lived there and another in Bolivar. beautiful! i will use this in our private devotions! MIke, Beautiful. Using it here on Kauai. Come see us. Ben, glad you are using the litany. I hope it is helpful. Kauai sounds great. Christie+, you are more than welcome to use the litany. I hope it is helpful for St. Francis. Thank you for your comment. We used it at the beginning of the liturgy (like the Great Litany) and it worked as a wonderful transition from the civil ceremony just held before our Eucharist service. Thanks again! Kurt, I am so glad the litany was useful. Thank you for letting me know. We also used it for our entrance procession. 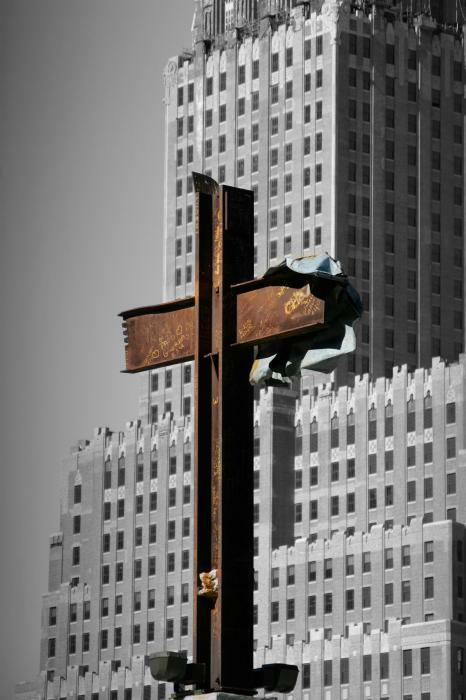 In our remembrance of 9/11 let us turn toward God and one another. This is a lovely remembrance. Thank you for sharing it with us. Amen. Thanks for sharing this Father Mike. God Bless You. God’s blessing be upon you and yours as well. Thank you. I appreciate you reading my blog. Sr. Ann, I hope the litany was helpful. It seems there are times when all we can do is cry out. Thank you for sharing your experience of that day, surely a sacred story. Maryanne, I am so glad to know the litany was meaningful. Thank you for your kind and encouraging words.